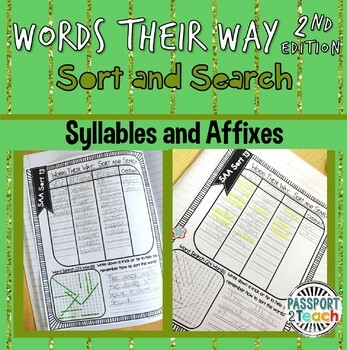 This packet is a companion to the Words Their Way Syllables and Affixes green book. It includes a sorting frame and word search for each of the 56 sorts in the 2nd edition green book. Each Monday my students cut out their words from the green book. They then work as a group to figure out the sort and organize the words. Afterwards, they write the words on these sorting sheets. They then grab a highlighter and start on the word search while the other groups finish up. 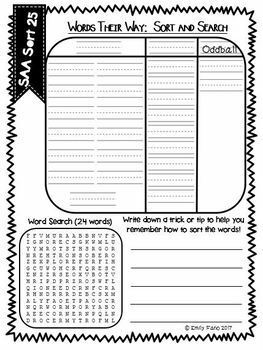 They LOVE working on the word search for the rest of the week and trying to find all the words! This is perfect for use in spelling journals or notebooks! If you like this product, click below for my other Sort and Search packets! 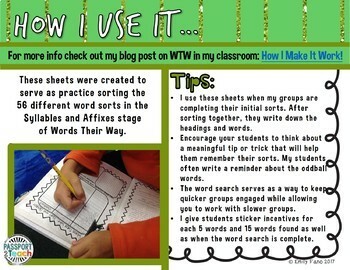 Noticing that your students don't remember what the words mean? Click here! Looking for the 3rd Edition packets? You're in luck! Looking for games to go with each Syllables and Affixes sort? Start here! More Words Their Way products are in the works! Click on the green Follow Me star above to receive updates about when they are available!